Being a parent of any child is challenging in itself, through in the child with special needs and it changes the entire equation. I have a child with spastic hemi-pelagic cerebral palsy. The entire left side of his body is affected. So between the normal doctor visits through in some PT, OT and speech therapy then add specialist visits into the equitation it can be a little stressful. Unfortunately there has been a time where my son, hunter needed to be transported to the hospital via the rescue squad. I have no EMS or fire department background personally, but I do know my child. I know him better that any doctor ever will. With that being said, every special needs child needs to be treated a little differently than a non-disabled child. 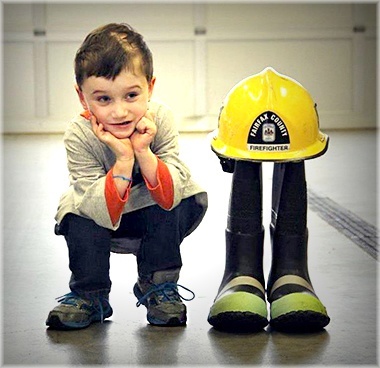 • Invite the child and family back to your fire house when the situation is over and done with. Show then what you do when you’re not running calls, become their friend! Please treat every patient as you would want someone to treat a member of your family. These children didn’t ask to be like this, it the way God made them. Hunter collects agency SWAG!! Send patches and stickers!! Visit his Facebook Page and leave him a note, then message for the address to send your agency support! !